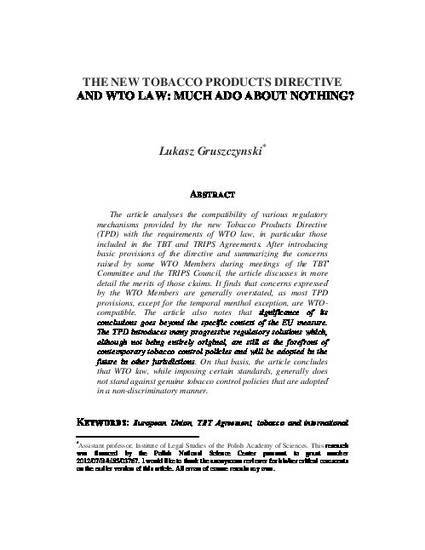 The New Tobacco Products Directive and WTO Law: Much Ado About Nothing? The article analyses the compatibility of various regulatory mechanisms provided by the new Tobacco Products Directive (TPD) with the requirements of WTO law, in particular those included in the TBT and TRIPS Agreements. After introducing basic provisions of the directive and summarizing the concerns raised by some WTO Members during meetings of the TBT Committee and the TRIPS Council, the article discusses in more detail the merits of those claims. It finds that concerns expressed by the WTO Members are generally overstated, as most TPD provisions, except for the temporal menthol exception, are WTO compatible. The article also notes that significance of its conclusions goes beyond the specific context of the EU measure. The TPD introduces many progressive regulatory solutions which, although not being entirely original, are still at the forefront of contemporary tobacco control policies and will be adopted in the future in other jurisdictions. On that basis, the article concludes that WTO law, while imposing certain standards, generally does not stand against genuine tobacco control policies that are adopted in a non-discriminatory manner.